Discussion in 'Manchester United Forum' started by roonster09, Sep 6, 2017. Manchester United's executive-vice chairman Ed Woodward has been appointed onto UEFA's Professional Football Strategy Council, following changes to the committee and leadership of the European Club Association. The position sees Mr Woodward placed as one of four senior executives in the role, who will advise and assist in the structure of European football's governing body, while he continues with his daily duties and position at Manchester United. The United chief is the only executive in English football to hold the role and is joined by representatives from Barcelona, Paris Saint-Germain and Celtic to form the newly appointed advisory board. Speaking of his new position, Ed Woodward commented: "I am delighted to have been appointed to represent the ECA on UEFA's Professional Football Strategy Council. The PFSC plays a vital role in shaping football across the continent and ensuring that it develops in a sustainable way, to the benefit of the game as a whole." Further changes to the European Club Association have seen Juventus' Andrea Agnelli become the second ECA chairman, following Karl-Heinz Rummenigge, who served in the position since the body was founded in 2008. In recognition of his significant contribution and commitment to the development of European club football over the past nine years, Rummenigge was awarded the first-ever ECA honorary chairmanship. Also taking up a new position is former United keeper and now Ajax's chief executive officer, Edwin van der Sar, who has been appointed as second vice-chairman to the ECA executive Board. The ECA, the bane of the nouveau riche of football eh. "Hope it doesn't interfere with his day job"
"Bring on easy draws lol"
edit:@Zoo , did you have to be faster? fecking RAWK and Bluemoon must be foaming at the mouth! Cheeky job for Edwin too. The ragspiracy rises. I'm disappointed this took 2 minutes to be posted. Kinda funny when the conspiracies come out, but to be fair we'd say the same things if it was a successful rival with seemingly 'inside' men. Remember that most are convinced of the Spanish agenda in UEFA. Wait till you see bluemoon. RAWK is just deluded. BM is full of nutjobs. So are we having this thread on both the United and football forums? Cooooool. 3 United managers in that elite coaching forum too. Jeez, being the United exec vice chairman itself is a full-time job, now Woody wants to forego his weekends by juggling another? My lazy mind will never understand the workaholic. Better get Mino Raiola on board to advise him there too, we are all mates here. My bad, didn't see the other one. I'm guessing the mods can merge them. Nah, let's keep both in case that Stockport mob miss one. BM will be like "Ragspiracy" for many pages and nothing else. There is most definitely a conspiracy. When the FBI were investigating FIFA they found evidence of several high profile champions league games being 'fixed' by UEFA (they never specified how). I had a few links saved but the links became dead over time; there was probably some sort of crackdown on releasing stories about it; a suppression of information. From memory, most of them were qualifying rounds, but there were a few group stage games and knockout games. Had a quick glance at BM, I thought they'd be all over the ragspiracy, but they're too busy voting against FC United in the North West M&S Energy Fund. We better win the comp now. If we don't win the champions league in the next 2 years then Ed is obviously incompetent and needs to go. Does anyone know our structure well? I thought he was Chief executive (which was Gill's position right? ), but you look him up (and the tweet above) and it says he is our executive vice-chairman... or am I just getting positions mixed up? David Gill all over again. 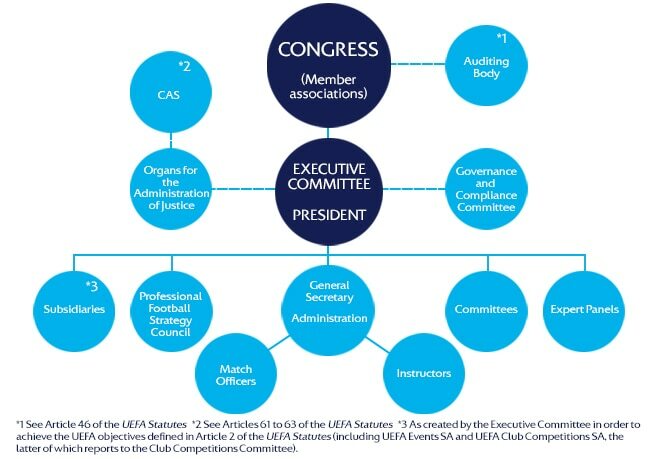 I think people might confuse UEFA executive committee, which is the highest UEFA executive body, with PFSC, which is more of a joint advisory council that brings together UEFA and european football bodies (ECA, EPFL and FIFPro Europe). Woodward was appointed by ECA (European club association) to PFSC. In the above diagram, David Gill is up there on the mighty executive committee at the heart of the diagram, while Woodward is down there on the PFSC board. But yeah PFSC still reports to the executive committe. Different titles, same job basically.